Believe it or not, my mother and father and I actually knew Elvis prior to him becoming the King of Rock and Roll. I guess you could say we knew him when he was simply a prince, not to be confused with the late artist formerly known as Prince. In the early 1950s, my father was a youth minister at the First Assembly of God Church in south Memphis. Elvis was one of the young people who attended First Assembly, and my mother and father and I sometimes picked Elvis up on Sunday mornings from his home in the Lauderdale Court Apartments to drive him to church. I have no memories of these times with Elvis since I was an infant propped up in the car baby seat on such occasions. 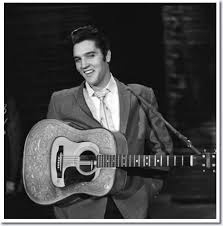 But when I was four years old, I snuggled up by my mother and father on the couch in our family living room to watch the black and white image of Elvis on our tiny TV screen as he sang and swiveled his pelvis. My mother was shocked. At one point she reached and put her hands across my eyes. My father just laughed, and I peeked. For Christmas in 1956 I got my first guitar and a toy stand-up microphone. I spent hours in front of the full-length mirror in my mother and father’s bedroom crooning into that microphone, swiveling my hips, and slamming my right hand into the side of the guitar. I never did learn to play that guitar, but I did my best to sing like the King. I was one of the first Elvis impersonators. My mother and father and I lost touch with Elvis over the years. We never drove by Graceland to pick up Elvis and take him to church. But I remained a fan, and I actually saw him in concert when I was in college and had long since given up my efforts to become an Elvis impersonator. I collected a lot of Elvis music over the years, beginning with the 45 RPMs I bought as a child, continuing with the vinyl albums I bought in high school, and the cassettes I listened to when I was in college. I even remember listening to Elvis on the old 8-track cartridges. You could actually listen to two Elvis songs at the same time as the tracks regrettably overlapped. I now listen to the King on the Elvis channel on Sirius XM Radio. I particularly love his Gospel music and his wonderful rendition of American Trilogy. I still get goosebumps when I hear Elvis belt out “His truth is marching on” at the end of the song. The late Johnny Carson once quipped, “If life were fair, Elvis would be alive and all the impersonators would be dead.” But actually, the truth of the matter is that when I’m driving in my car listening to Elvis on the radio, he is very much alive. And when I sing along with him, I don’t feel so bad myself.